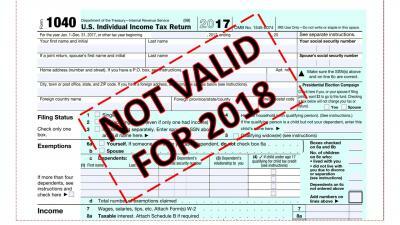 As you're filling out your 2017 tax return, take the opportunity to think about how the new tax law will impact you for 2018 and beyond. To help, I've put together a list of the changes, organized by line number on the 1040 and Schedule A (Itemized Deductions). If you file the 1040A or 1040 EZ, your lines numbers will be different. There's been a lot in the news about the changes, but it may be hard for you to get your head around. I hope that organizing the information this way will make it easier for you to see how you will be affected. As you see the large number of changes, you can understand why it has been hard for anyone to come up with a rule of thumb about how the law will affect different groups of people. To estimate your bottom line - how all of these changes together will impact you - try an online calculator. There are many available online. The Tax Policy Center's calculator let's you use a pre-defined, typical household's scenario, or enter your own information. Entering your own info will likely yield the most accurate result, especially if your income is from sources that are taxed differently (i.e., long term capital gains, Social Security benefits, business income). Of the calculators I tried, I preferred this one because it lets you be more specific about my income sources. Below the boxes that show how much you're expected to owe, click "See Detailed Breakdown" to see exactly how your estimate was calculated. Several websites use the Trump Tax Calculator created by Marketwatch. This quick-and-dirty calculator only asks for a few pieces of information. One thing I liked about it was that, it shows your income split across the different tax brackets, so you can see what tax bracket you are in and how your tax is calculated. Temporary changes that will expire: Most of these changes are in effect from 2018 through 2025. Barring additional legislation, they will revert to the old (2017) rules beginning in 2026. There are a few exceptions to the effective dates; those dates are in bold in the tables below. Expiration dates refer to calendar year taxpayers. Some taxpayers may use a fiscal year that ends on a different date. Permanent changes: This includes new laws and the repeal of prior laws. These will be permanent, at least until additional legislation changes them. In the tables below, for each change I've listed either the expiration date or noted that this is a permanent repeal or new rule. After looking at this, please let me know if you have questions or comments. I will try to address those in a future post. Also, please let me know if you see anything that doesn't seem right. There is so much detail in this new law, it's possible that I got something wrong. There are some changes that I purposely did not include, since they didn't fit neatly into these line items. You're probably wondering why I haven't talked about the new tax rates here. That will come in my next post. First, I'll show you how tax brackets work. Then I'll show you the new tax rates, and you'll understand their impact better. I'll also address some of the other changes that I didn't include here. This is a list of everyone "covered" by your tax return: you, your spouse, and dependents. On line 42, you get an exemption of $4050 for each person. An exemption reduces your taxable income. Alimony is taxable income for the recipient and a deduction for the payor. The recipient can count alimony as "earned income" for the purpose of determining whether you can contribute to an IRA. Many taxpayers have business whose income "flows through" to the individual taxpayer and is reported either on Line 12 for sole proprietors or Line 17 for partnerships and S corporations. Moving expenses associated with a job change at least 50 miles away can be deducted. This deduction is a tax incentive for businesses that produce most of their goods or work in the U.S. rather than having it done overseas. Every filer can claim the standard deduction, unless they are claimed as a dependent on someone else's tax return. The amount is based on your filing status: $6350 for single persons and married individuals filing separately, $12,700 for married persons filing jointly, and $9350 for heads of household. If your itemized deductions (listed on Schedule A) are larger, you claim that amount instead. You get an exemption of $4050 for each person listed on line 6. AMT is a second way of calculating your income tax. If the AMT calculation shows that you owe more tax than the regular calculation, you must pay the additional amount. AMT was originally designed to make sure that higher income filers didn't avoid paying income tax. A credit of $1000 per qualifying child is applied to any tax owed. The credit is not refundable, although there is a separate refundable credit that can be claimed if you aren't eligible for the entire Child Tax Credit. There are income limits. For married taxpayers filing a joint return, the credit is phased out beginning at $110,000, at $55,000 for married taxpayers filing a separate return, and at $75,000 for all other taxpayers. If you and your family did not have health insurance for all of 2017, you may have to make a "shared responsibility payment." Tax is calculated based on the type and amount of income (i.e., ordinary income, including wages and interest, and long term capital gain income or qualified dividends). Expenses over 10% of adjusted gross income are deductible. If the taxpayer or spouse was born before Jan. 2, 1952, they can deduct any expenses over 7.5% of AGI. Beginning in 2019, the threshold reverts to 10%. 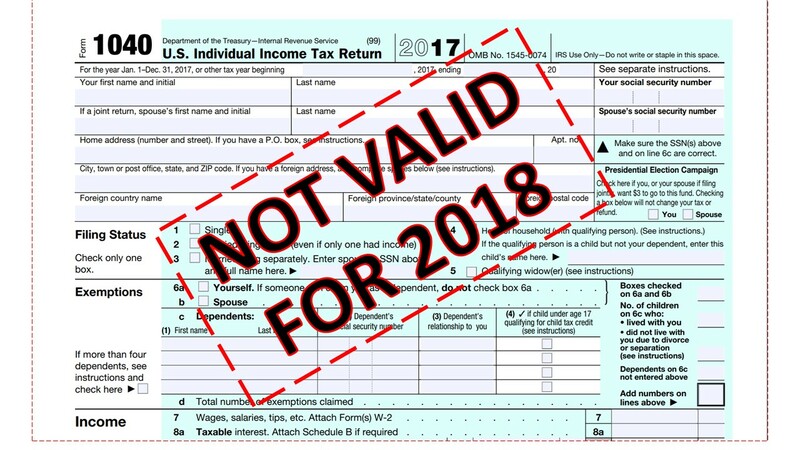 Income taxes withheld or paid in 2017, or sales taxes. Deduct mortgage interest on up to $1 million of loans used to buy, build, or improve your home. Deduct interest on mortgages up o$100,000 that were not used to buy, build or improve. For cash contributions, the deduction is limited to 50% of adjusted gross income. No deduction is allowed for amounts paid to a higher education institution in exchange for the right to purchase tickets or seats at athletic events. A very few specific deductions are allowed here. Gambling losses can be deducted but only to the extent of any winnings reported on Form 1040, Line 21. The itemized deduction is limited for certain high income taxpayers. Correction: The effective date of the repeal of the Domestic Production Activities Deduction is tax years beginning after Dec. 31, 2017 for all entities. I previously said that the effective date for C corporations was later; that was incorrect.